NBD continues to support local organizers of carnival events. The Bank recently presented sponsorship cheques to the organizers of the National Teen Pageant and the Mothers' Queen Show. NBD will be the official sponsor of one of the National Teen Pageant contestants, Ms. Omisha Francis of the Pierre Charles Secondary School. 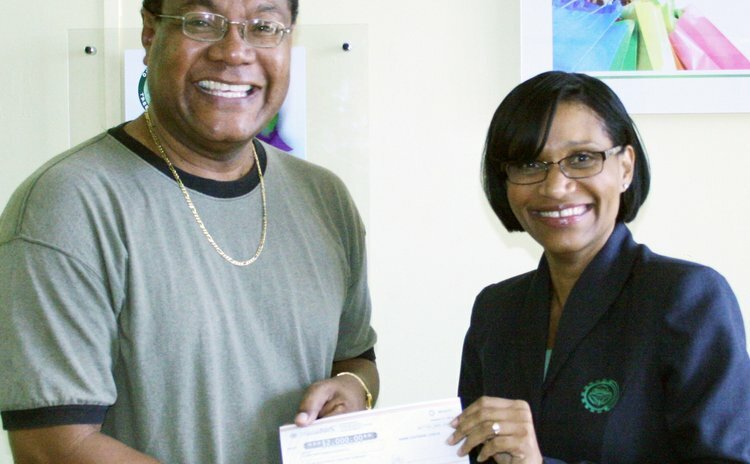 A cheque of $2000 was presented to Mr. Raymond Lawrence on behalf of the Pageant's organizers. NBD also confirmed their partnership with organizers of the Mothers' Queen Show by making a $1000 contribution towards the traditional wear round of that event. Mrs. Suzanne Piper, Executive Manager of Marketing said "We are pleased to support organizations such as these that play their part in making our carnival spectacular and unique. Each of us can contribute to the development and promotion of this national cultural event. NBD encourages participation in carnival from all ages." During its 35 years of service, NBD has been a great supporter of carnival and has sponsored numerous carnival events. Visit the Bank's Facebook page for updates on these and other NBD sponsored events.